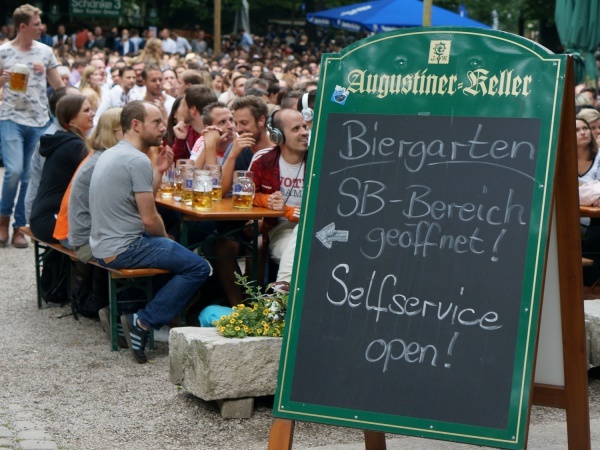 Augustiner-Keller with about 5,000 seats is the third largest beer garden in Munich. The beer garden opened in 1812. Like most beer gardens there is a self-serviced area where guests are welcome to bring their own food in addition to a serviced area. The beer at Augustiner is served straight out of wooden barrels and the strike of a bell marks the announcement of the opening of each new barrel. The serviced area includes over 100 Stammtische (regulars tables) with the oldest dating back to 1847. In 1807 a cellar was built eight metres below ground in which beer was chilled with ice. Today, this cellar offers a cosy alternative to sit down and enjoy a beer on rainy days. A Maß of Augustiner Edelstoff from the wooden barrel costs €7.40 (May 2018). When good weather, the beer garden is open from 11.30am until midnight.